license plate reflector and wing nut set, giving an extra element of safety. 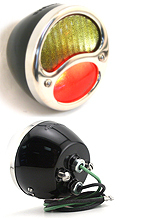 These two reflectors with wing nut mounts, holds the number plate to the rear light bracket. A great safety item! Set of 2 reflectors. 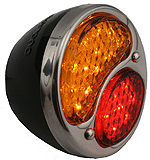 Left side 1928-31 Duo lamp tail light in stainless. Duplicate of the original Ford unit. This left side has lens on bottom to shine down on the number plate. ( Right does not). All have 6-volt bulbs and have a half amber lens. Best to order in pairs, as there are a two different manufacturers of these. Note: top lens is brake light, bottom lens is tail light. 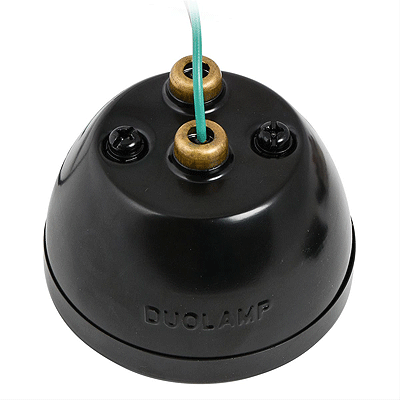 If you need a twin filament bulb installed, you will need to convert them using our A-13412-DC socket adaptors. 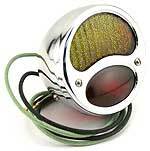 Right side 1928-1931 Duo lamp tail light in stainless. Duplicate of the original Ford unit. (No number plate lens on the bottom). All have 6-volt bulbs and have a half amber lens. Left side 1928-31 Duo lamp tail light in Chrome, as used on the 1928-29 Model A. This is a duplicate of the original Ford unit and has the lens on bottom to shine down on the number plate. Fitted with 6-volt bulbs and a half amber lens. Left side commercial tail lamp ( WITH number plate light). 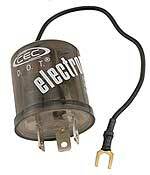 All Commercial vehicles originally used a lamp with a black painted housing and stainless rim. This all dark version, has a black powder coated housing with a black rim. 12v bulbs fitted. The top lens is amber. (complete red lens available seperately if required). Right side commercial tail lamp (NO licence plate light). This all dark version, has a black powder coated housing with a black rim. This lamp has a black powder coated housing with a polished stainless rim. 6v bulbs fitted. Right side commercial tail lamp. (NO licence plate light). This lamp has a black powder coated housing with a polished stainless rim. 12v bulbs fitted. (No number plate lens on the bottom). 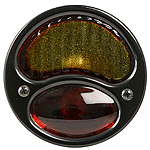 12 volt negative earth, polished stainless steel 1929-31 tea cup style lamps with red/amber LED style lens. This one also has the number plate light below. Note: When used as indicators, you will need to use the A-13311-12X flasher unit. This one has NO number plate light. 6 volt positive earth, polished stainless steel 1929-31 tea cup style lamps with red/amber LED style lens. tea cup style lamps with red/amber LED style lens. (Commercial vehicles used a lamp with a black housing). Use these universal style sockets to convert any side or tail lamp to a dual filament bulb that can be used for turn signals or just to convert a gas lamp to electric! You will have to modify your lamp to accept these. Accepts bulbs with staggered pins. 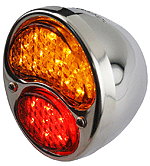 This is the complete nickel finish drum style tail light for the left side on the 1928 and early 1929 Model A. This one has the number plate light window. 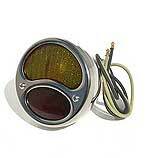 This is the complete nickel finish drum style tail light for the right side on the 1928 and early 1929 Model A. (No number plate window). This is the complete black finish drum style tail light for the left side on the 1928 and early 1929 Model A commercials. This one has the number plate light window. This painted version was used on all commercial vehicles. Top quality! Made in USA. This is the complete black finish drum style tail light for the right side on the 1928 and early 1929 Model A commercials. (No number plate window). This painted version was used on all commercial vehicles. Top quality! Made in USA.